Our college admission is based on local admission test known as AP EAMCET. For a person to be eligible to get our college LBRCE, he must score a very good rank as per reservations. Our college is one of the top colleges in Andhra Pradesh. EAMCET is the entrance exam. Passing EAMCET and class 10+2 are the eligibility criteria for the course in Lakireddy Bali Reddy College of Engineering. The typical cutoff is below 10000 ranks in EAMCET for my course. The admission procedure is through the 12th standard marks. The entrance examination to be taken to get into LBRCE is AP EAMCET and is based on the reservation criteria we will be into the course. I have taken AP EAMCET entrance examination to get into LBRCE. The eligibility criteria are that a student should be passed in class 12th intermediate examination. The typical cutoff is about 40/150. The typical cutoff is to have AS EAMCET rank below 18000 and this is the eligibility criteria. The admission procedure is to submit our original certificates according to the order of LBRCE administration. The eligibility criteria and admission procedure for my course in LBRCE are 10+2 pass and EAMCET examination. There are no such cutoffs for my course. Eligibility criteria include having passed class 10+2. EAMCET is the entrance examination for admission in Lakireddy Bali Reddy College of Engineering (LBRCE). The cutoff is within 20000 ranks in EAMCET. The eligibility for our college is that a person should complete his/her intermediate.he has to get a good score in AP EAMCET rankings and the branch you needed will be based on your ranks. You need to quality in EAMCET examination in order to get admission in Lakireddy Bali Reddy College of Engineering. The admission is based on the cutoff marks. It is through AP EAMCET exam. And also the College has given Admissions through MANAGEMENT QUOTA(NRI). There is a common entrance exam named AP EAMCET entrance examination. Through that, by government procedure, the seat will be allotted in LBRCE. There is no admission procedure for any of the courses in Lakireddy Bali Reddy College of Engineering , Krishna. I didn't take any exam for getting admission in LBRCE. 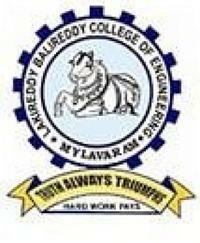 I joined Lakireddy Bali Reddy College of Engineering through EAMCET exam. Each course is having its own cutoff marks. One can get admission in LBRCE through EAMCET ranking. The cut off ranking is below 20000 in EAMCET. The entrance examination is EAMCET. Eligibility criteria are to have passed 10+2 and EAMCET entrance exam. Cut off is within 15000 ranks in EAMCET exam.